In the world of IT, there are many different professions that are considered “high-tier” and are essential to one or the other part of the industry. Different companies require different professionals to help them advance their business and platform development. However, there are certain specific specialties that are not so easy to crack. These professions require years of studies and hard work – in turn, they are constantly in demand when it comes to the job market. 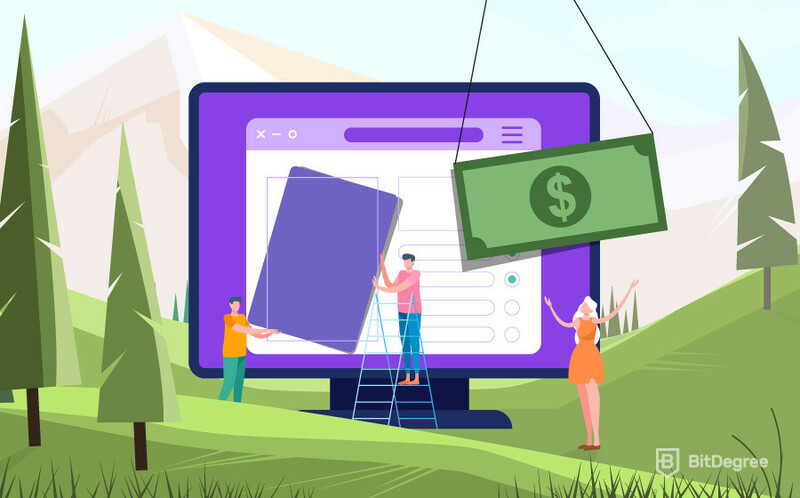 DevOps engineering is one such profession, and in this DevOps engineer salary article, we’ll take an in-depth look into just how much money these people make. In the very beginning, we’ll talk about what is DevOps engineer. It’s important to know what does a DevOps engineer do before we can start talking about the DevOps engineer salary. Once we get that out of the way, we’ll move on to discussing the main types of DevOps engineers that you might encounter. This is important simply because the DevOps engineer salary varies according to the type of an engineer that we’re talking about! Finally, at the very end, we’ll talk about the numbers themselves. If you spent a lot of time on the internet in IT-related communities, you’ve probably heard the term “DevOps engineer” quite a few times before. However, to this day, there are still a lot of people who don’t really know what is a DevOps engineer. To clear the confusion, let’s talk a little bit about the profession in question. Don’t worry – I won’t go in-depth. This article isn’t a job description! With that said, however, you should still get a pretty good idea of what does a DevOps engineer do. DevOps engineers are people who work with different development teams to help them solve and develop some specific parts of a code. This code is most commonly concerned with software development – whether it be a small company or a giant corporation, DevOps engineers help the companies advance their platforms by working on the code that they’re based upon. The term “DevOps” itself is made out of two words – “development” and “operations”. This means that a DevOps engineer has to possess the skill needed to work with teams of people that are not directly related to the processes of coding. 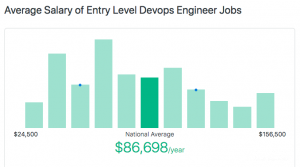 One thing that is definitely worth mentioning before talking about the DevOps engineer salary is that the term itself – DevOps – is sort of made up by the IT industry. There isn’t really a specific career path known as a “DevOps engineer”. Sure, you’ll find a lot of information about these engineers online (everything from their job descriptions all the way to the DevOps engineer salary), but what I mean is that there is no specific university degree called “DevOps engineering” that you have to finish to be able to work this job. Rather, it all depends on your skill set and prior experience with coding and working in teams. Now that you have at least a very basic idea of what is DevOps engineer and what does a DevOps engineer do, there’s one last thing that we need to cover before talking about the DevOps engineer salary – the different groups of DevOps engineers. In every career path that you might choose to follow, you might find that there are different classifications. What do I mean by that? Well, to put it very simply, each job title has a separate sub-title attached to it. This sub-title usually depends on the job in question, but most jobs in the world tend to apply the same classification system. Let me give you a quick example. Imagine that you’re an owner of a coffee shop. Now, you want to hire two baristas – people who would be able to serve coffee to the customer of your shop. Two people apply for the job position, and you take them both in for an interview. During the interview, you find out that person A has five years of experience of working as a barista, and knows almost everything there is to know about making coffee for a living. As opposed to that, person B has come to apply for their very first job ever. If you were to hire these two people, you probably would want to distinguish them from one another! This is where the job tags come in – you would probably define person A as “junior barista”, and person B as a “beginner barista”. These job sub-titles aren’t only used to define a person’s skill level or, in our case, a DevOps engineer salary, though. They also represent the amount of work and responsibility that a person is assigned. Now that you have an idea of what job “tags” are and what they’re used for, let’s go over the ones that we’ll be using in this DevOps engineer salary article. Entry-level DevOps engineers are newcomers to the industry. The most common entry-level engineer is someone who is still in their third or fourth year of college, and are getting ready to finish their studies and turn towards DevOps engineering. Since there are no “direct” paths of becoming such an engineer and earning the esteemed DevOps engineer salary, everyone has their own way of getting into the industry. Some students choose to pick a specific field that’s related to DevOps and stick with it, others try to find a company that would offer them special training aimed at preparing DevOps specialists. Traditional education isn’t the only way, though. More an more young people turn towards online learning options. This isn’t only exclusive to the field of IT or the DevOps profession, however. That being said, it CAN be clearly seen in the case of DevOps – this is because of the profession’s ambiguity. Entry-level (or beginner) DevOps engineers have the easiest tasks in the company. Since their whole job description is very much learning-based, they are often tasked with educational tasks. These can be of two kinds – either beginners are taught coding exercises, or they are tasked to learn to work in a team (since the latter is a very important feature for a DevOps engineer to possess). As for the beginner DevOps salary, people say that it’s quite representative of the work that they do. However, it should be noted that even though entry-level engineers make the lowest DevOps engineer salary out of the three groups covered in this article, the profession is still infamous for having huge salaries, in general. That’s just something to keep in mind moving forward! Junior DevOps engineers are the most common group of people that you’ll encounter within a company (as compared to the other two groups in this article). This is because they are the largest group – and no wonder! Since there are no objectively defined boundaries that would separate these groups (it’s all mostly broad standard and individual company decision-based, there’s a lot of overlap happening between them. This overlap results in some groups having somewhat blurry lines – you might encounter some junior DevOps engineers who have shaken away from their “beginner” tag, or others who are long-overdue to become senior DevOps. This doesn’t only cause confusion, though – it becomes very difficult to objectively discuss the junior DevOps engineer salary, since it fluctuates all the time. When it comes to the work that junior DevOps engineers do, it varies. These people are usually the backbone behind the communication processes – they have to work with the development teams to ensure that everything is up to par. This means that junior DevOps engineers have to have a lot of training and learning to back up their skills. They are mostly assigned tasks that are crucial to the company, and are not as learning-based as the ones that entry-level DevOps engineer work on. That being said, however, this does not mean that this is where the learning process of a junior engineer stops – on the contrary! If a junior DevOps wants to one day become a senior, they need to dedicate most of their time to perfecting their skills. Sure, they might already have the fundamental knowledge, but there’s still a lot to learn. As I’ve mentioned a bit earlier, the junior DevOps salary is a tricky subject. At any given point in time, it might sway to the extremes – either low or high. Senior DevOps engineers are the most seasoned veterans of the industry. They are professionals of both programming and the intricate processes of platform development. Senior DevOps engineers have various different responsibilities within the company. Surely, their main focus lies in making sure that the code is running smoothly (and communicating with other teams to share essential information, as well), but there are other processes that these people are concerned with, too. A good example can be mentoring – this applies almost to every profession out there, but DevOps engineers have a “double” responsibility. Not only do these specialists have to make sure that the newbie’s programming skills are in order, but also whether or not he or she is able to work in a team-based environment. 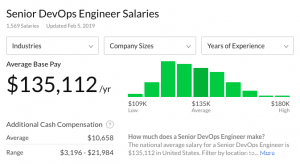 When it comes to the senior DevOps engineer salary, things are pretty clear – it is the salary that is most often referenced when talking about “what is DevOps engineer and why do these people make so much money?!”. However, once we talk about the actual numbers, please keep one thing in mind – senior DevOps engineers have dedicated their entire lives to learning the processes of DevOps, and applying them in their own workplaces. And DevOps engineering is no easy feat! It requires a lot of hard work to truly master! Now that we have the job descriptions and job “tags” out of the way, we can finally move on to talking about the DevOps salary. Before we jump into the numbers, however, I’d like to mention a few key things. First of all, I’ll be using the average salary in the US as a reference point for the DevOps engineer salary. As of writing this article, the average monthly salary in the US is around $3700 USD. When talking about the entry-level DevOps engineer salary, you need to keep a couple of things in mind. First of all, beginners are mostly concerned with learning-based tasks. Their aim is to prove themselves to their new employers, and to learn all of the fundamental tropes of the industry. So, with that said, what is the entry-level DevOps engineer salary? According to Ziprecruiter.com, the beginner DevOps salary should be around $86,700 USD mark (per year). This comes out to be $7225 USD per month! Needless to say, that’s an amazing salary! It’s almost double that of the average salary in the US! This just goes to show how truly difficult this profession is. Even though the junior DevOps engineer salary is really difficult to state and analyze, Payscale.com still provides us with a specific number. According to the website, the average junior DevOps engineer salary in the US is around $91,500 USD annually, or $7625 USD per month. Finally, we have the senior DevOps engineer salary. Let’s take a look at what Glassdoor.com estimates it to be. 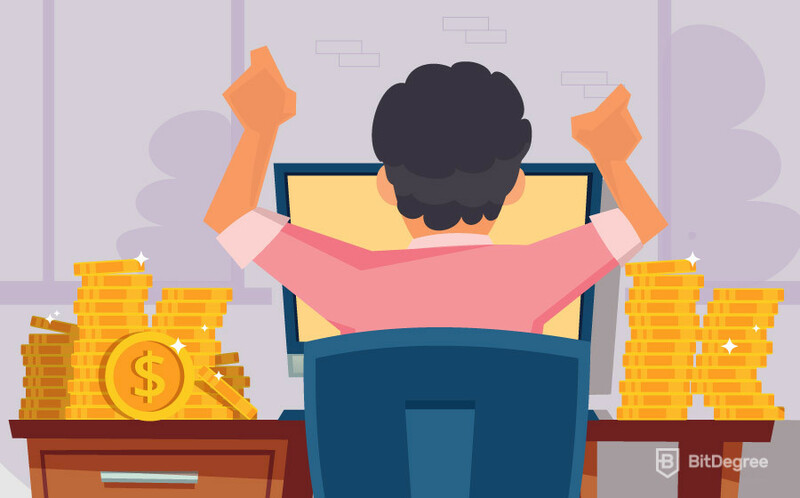 According to the site, the senior DevOps engineer salary should be around $135,000 USD per year, or $11,250 USD per month! That’s a dream salary right there! However, let me stress this once again – senior DevOps engineers have dedicated their lives to this difficult craft – it’s only natural that their salaries would represent this fact!